This is yet another great poster released for this film. Clearly, we have the comparison of the pure and holy with the profane and corrupt. But this is also an image of identity, because the face--which is torn in half--symbolizes more than anything else about us who we are, it's our identity, how people recognize who we are. So, we are either going to make a conscious choice to be as holy as possible or, by lack of making that conscious decision, we are going to allow ourselves to slowly be corrupted and decay. The fire, the embers we see stretched across the image, are the means by which we choose: for those choosing holiness, there is the fire of purgation, the fire that cleans away and purifies anything not pure and holy, or there is the fire of damnation, that which we feed and give into in life (the burning need to feed an addiction, for example, the fire of lust, the fire of wrath, etc.) and both are choices we make, even if we choose not to choose, we have agreed to damnation because we refuse to fight. 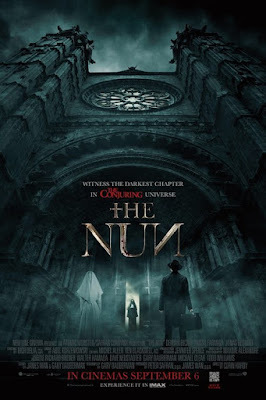 A brief, new trailer/clip for The Nun has been released, and it's pretty terrifying, in the way that a good horror film should be terrifying, but it also has a remarkable amount to say regarding the advancement of the spiritual life (our discussion on the first trailer can be found at this link here if you are not familiar with it). I mean, can anything be more terrifying than being buried alive? 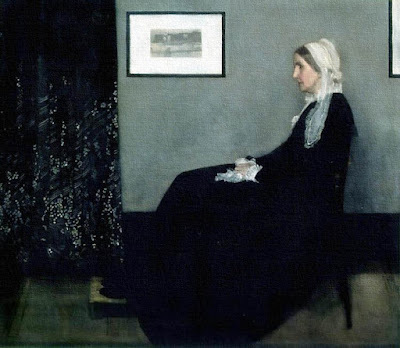 We know that when a character is asleep, then we see them waking up, that's actually a signal that the events about to transpire have sparked a spiritual awakening within the character, they are "alive" to what is about to happen and that character is, in essence, finding their "calling in life" at that moment. When we see a character in bed, that suggests something has died in the character or has been dead but is about to be reborn because the bed is a "temporary" coffin, and the nightly sleep we take foreshadows our eternal sleep in the coffin. So, what does it mean for Father Burke to be "buried alive?" We don't know very much about the background of Demian Birchir's character (Father Burke) who is a priest investigating the abbey in question in the film, but there seems to have been some trouble in his past; who can blame him, he's human after all? But it's probably extremely significant in the clip above--and this is assuming that the clip will be the same clip in the film, we have been witnessing "extra footage" being used in trailers that never actually make it into the films at all, so we have to keep that in mind--that Father Burke falls, and that he falls backwards. "Falling" is a symbol invoking the original fall, Original Sin in Eden, so he's battling something innately human in us all, but as Christians, we are called to overcome. The "backwards" usually invoked the past, that is, something specifically from Father Burke's individual past (from before the investigation began is most likely, but possibly something that just happens earlier in the investigation) which causes him to be "weighed down" so he can't regain his balance and avoid "falling." As Father Burke falls backwards into the coffin, there is a mysterious flash of green light near where his head is (0:01) that goes out quickly. We know the color green either symbolizes hope and new life, or that something has gone rotten and died. This is the struggle of the spiritual life: will this battle Father Burke endures in this scene be his victory which leads him to new life, or will the green light foreshadow that he won't be able to defeat his foe and his doom is sealed? This is also the spot at which Valak, the Nun, will appear behind him, so it could be a foreshadowing mechanism that he's not alone in the coffin, but we are never alone. First, he has a light: the "flashlight" is the symbol for the "light in the darkness" which those familiar with the depths of the spiritual light guiding them are familiar (think of the pillar of fire guiding the Children of Israel through the desert by night) so, we know from the flashlight that Father Burke is "armed" to do this battle (he even has a lighter to give more light, this suggests that he is spiritually advanced and prepared). But here is the thing about the spiritual life: God always seems to give us more than what we are capable of bearing, intentionally, because we are not meant to bear these battles alone, this brings us to the coffin. 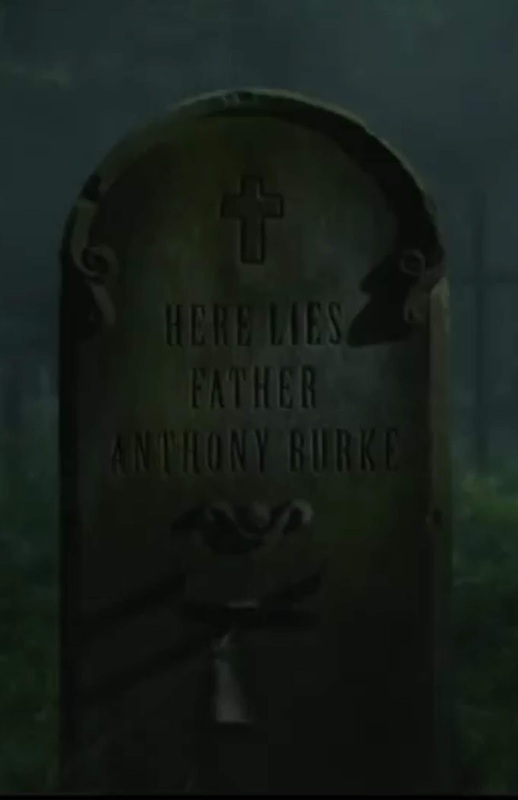 When Father Burke falls back into the coffin, there is a string, a small piece of twine, which he pulls (0:05) presumably to ring the bell on this headstone we see. The string and the bell are two invaluable symbols to know. First, the string in and of itself suggests the "umbilical cord," and this is absolutely one of my favorite symbols to see in a movie. I know you might think it a bit of a stretch, but please trust me on this. We begin life in the womb, where it's dark, and we end life in the grave, also where it's dark, so the "womb/grave"dichotomy is important: from life comes death, and from death comes new life (or so we hope because that's what God promises us). The umbilical cord is how we are fed in the womb and, in return, we grow and are prepared to be born. Father Burke holding this string emphasizes his birth, specifically, his baptism, his dying to sin and being born to a new life of fighting Satan, and then again his ordination as a priest, again, his dying to worldly affairs and being alive to the needs of the soul and spirit. It appears that the string rings the bell (which is blurred in this image) on the tombstone to alert someone that the person is still alive (we'll just have to watch the film to get a better idea of why that is on the tombstone, we don't get enough information here), but bells have important symbolic significance: they drive away demons. If you have ever seen the Disney film Darby O'Gill and the Little People (Sean Connery's first starring role), then you might recall Darby going to fetch the new bell for his parish and, in thanks, his priest dedicating the ringing of that bell to Darby and his descendants; when the bell rings, Darby puts off making his third wish to King O'Brien, then his daughter falls sick, is about to die, and because Darby had listened to the ringing of the bell instead of making a wish then, he is able to make his third wish be that death takes him instead of his daughter (if you haven't seen it, trust me, it all works out great). Father Burke pulling the string--the symbolic umbilical cord of his birth within the church--to ring the bell--the melody of which drives demons away--suggests that he's going to come out triumphant in this battle because he has all the spiritual preparation he requires in order to defeat Valak. We discover from the tombstone that his first name is "Anthony," and the name is the name of many, many great saints, but it also stems from the Greek word for "flower," and that's important because a "flower" is meant to bloom, it's meant to come to fruition, and it's the spiritual battles he endures, such as this one, which will cause him to bloom to the greatest possibly degree. "Living death" is a extremely advanced state of the spiritual life--think of the little girl who died and Jesus raised back to life, or Lazarus, and the Resurrection itself--this is the point in a person's spiritual journey when the wheat kernel dies so more can come from it, and nothing says "death" like a coffin. So Father Burke is undergoing this intense moment of spiritual death--his will, his actions, his plans, his very "I" is completely ineffectual in facing Valak-- and this reading is validated by the rock on the sides of the hole in which the coffin lies (barrenness, no dirt where something can grow, just barren rock). The purpose of this barrenness is so one can turn from "dead rock" where nothing grows, into the "living stones" that steadfast and upon which more can be built. All this sounds great, but when you're the one going through it, it's not very comforting, is it? Like Father Burke, we just want to get out of the coffin. But then, that is the moment it gets interesting. I believe this is the third poster released for the film, and it's a good one. 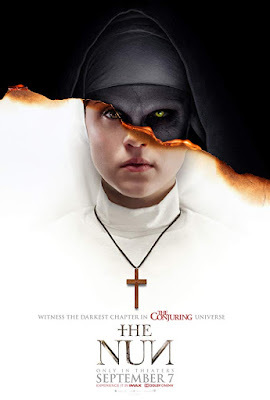 To begin with, it very much invokes the original horror film starring a Catholic priest, The Exorcist, when the priest stands in the fog looking up at the house where the possessed girl is. Secondly, we know that a house symbolizes the soul, because a house is the home for a body, the way the body is a "home" for the soul while on earth, and in an abbey, such as the one pictured above, where the nuns live and focus solely on the soul, this is even more poignant. We are called to become a "living temple" for the Trinity to dwell within, unfortunately, the bad decisions of one nun--rather like Judas--have triggered the downfall of the entire abbey (which only shows that none of the nuns were ready to do the battle facing them, otherwise they would have been victorious, and God chooses to work this way sometimes). So, we have two Christians--the novice nun in white, and the priest with baggage, meaning, he figuratively is bringing spiritual baggage with him to this battle--coming from the outside to face down this great evil and restore the Temple to God, and this often happens in our own lives as well. We need outside help to restore the Temple that should be within us. 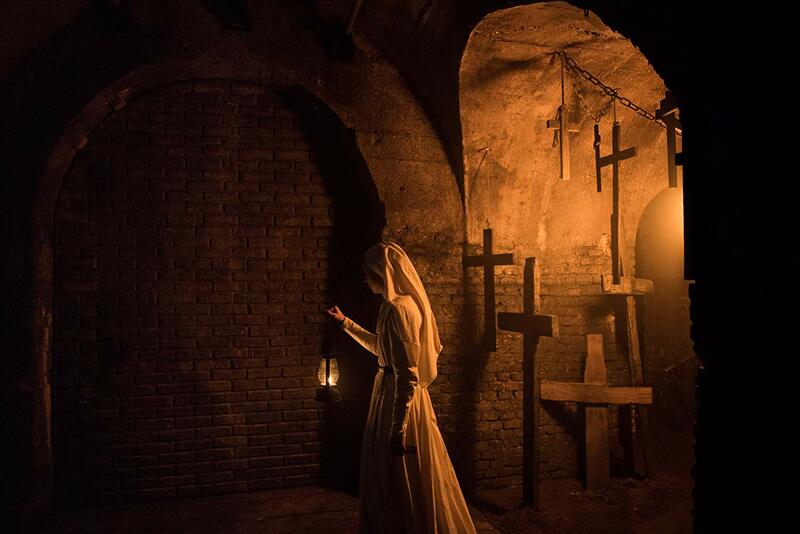 Like most people being buried alive, Father Burke screams for help and pleads for this to not happen to him, and this is bad enough, but now, Valak is going to join him in the coffin. If you are paying close attention, Valak's face appears over Burke's left shoulder, the same place the witch Bathsheba first appears over the shoulder of Carolyn Perron in The Conjuring (the first film in this series). We know that hands symbolize a person's honor, and a person's face is the seat of their identity, so Valak's lack of honor (his hands) clasping Father Burke's face is an attempt to destroy Father Burke, obliterate him completely, the way Valak probably did with the nun who committed suicide. This is another image we haven't seen before and it, too, highlights the spiritual life. Sister Irene (which means "peace") stares at a brick wall; why? When God closes something to us, He completely closes it; when He opens something to us, He opens it completely (and, for us, that includes coffins that are going to bury us alive). Something in Sister Irene's life--prior to joining the investigation or during the events taking place--was closed to her by God, and she is being called to accept that as His will for her. Does she? Well, she holds a lantern, much as Father Burke held the flashlight and lighter in the coffin trailer above, so she's armed for the spiritual battle to which God calls her. Not only does light symbolize "the light of Faith," but also the "light of illumination," and so she not only has faith in God, she is sufficiently illuminated about her own self to know her weaknesses (temptations to sin) so she can avoid those pitfalls. She appears to me, in this scene, to be like one of the ten virgins with their lamps who went out to meet the bridegroom (Matthew 25:25). Going back to Father Burke in his coffin, when he opens his lighter to see inside the coffin, he looks down at his feet, and then keeps looking down at his feet; why? The feet symbolize the will, because the will takes us in life where we want to go (in terms of achievement, values, priorities) the way our feet take us to where we want to go. So, Father Burke, in looking at his feet with the "light of illumination" is questioning his will: "Is this what I signed up for when I was baptized? Is this what I signed up for when I became a priest?" or, it could be, "Had my will been stronger not to sin, had my will been to do God's will instead of my own will, I wouldn't be in this battle right now." And that questioning of ourselves, our motives and God's will and how we have followed or failed to follow Him is the act of discernment and how we gain illumination. This is the point of the spiritual war Christians are called to wage: we are called to victory. Father Burke will either emerge from this battle with his identity even more firmly rooted in Christ than ever before, or he will completely lose his identity and being all together (this is what is meant by having your name blotted out of the Book Of Life, because like your face, your name is a part of your intimate identity, and to have it "blotted out" means it no longer exists). So, we will have to wait and see if he is victorious. (Complete discussion on the first trailer can be found at this link here).